Athletes staying at one of the team hotels for the World Championships in London have fallen victim to a suspected outbreak of norovirus. Public Health England says 30 athletes and support staff have been affected, with two cases confirmed as the bug. 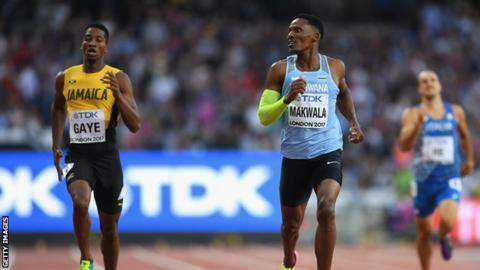 Botswana's leading 400m contender Isaac Makwala has been withdrawn from Tuesday's final after vomiting despite saying he was "ready to run". German and Canadian athletes staying at the Tower Hotel fell ill last week. German triple jumper Neele Eckhardt collapsed but was well enough to compete on Saturday, and was last in Monday's final. The Ireland team, who are also staying at the hotel, have confirmed that one athlete - 400m hurdler Thomas Barr - has been affected. A Local Organising Committee (LOC) statement said: "There have been a number of cases reported by team members residing within one of the official team hotels. "Those affected have been supported by both team and LOC medical staff. In addition we have been working with Public Health England to ensure the situation is managed and contained. "As a result, further advice and guidelines have been issued to team doctors and support staff." The Tower Hotel said investigations conducted with environmental health officers and the International Association of Athletics Federations (IAAF) had shown the hotel was "not the source of the illness". That has also been confirmed by Public Health England. The hotel added: "We have followed strict hygiene protocol, ensuring that those affected are not in contact with other guests and all public areas have been thoroughly sanitised." Makwala, 30, was one of the favourites for the 200m and was withdrawn from the heats for the shorter race on Monday. He was also considered to be the main challenger to Olympic champion and world record holder Wayde van Niekerk in the 400m before being withdrawn from that race too. The IAAF said Makwala withdrew from both Monday's 200m heats and, later, Tuesday's 400m final "due to a medical condition on the instruction of the IAAF medical delegate". He attended the stadium before the 400m final on Tuesday but was ordered to leave by IAAF officials. He had earlier told BBC Sport: "I could have run. I did my warm up well and I was ready to run. "This is bad. Sometimes I feel heartbroken. Yesterday, I was ready for this. I worked hard for this." Niels de Vos, the head of UK Athletics and London 2017, said strict procedures were in place at the hotel in question. "I guess in any event when you have 20,000 minimum accredited people coming in from every corner of the world there is the possibility that someone might come in with a bug and we think that's what's happened here," he said. "We've moved people as appropriate and where people are coming in we've found alternative accommodation for them so we're doing absolutely everything we can." How do you catch norovirus? Stomach bugs that cause diarrhoea and vomiting are very common and easy to catch. You can get them from eating contaminated food or through contact with people who have got gastroenteritis. If that infected person doesn't wash their hands before handling your food or touching objects and surfaces that you then touch, there's a good chance you could get sick too. A person with gastroenteritis is most infectious from when their symptoms start until a couple of days after all their symptoms have gone.